NKOTB was featured on E! News summer concert series. Here is the video clip! 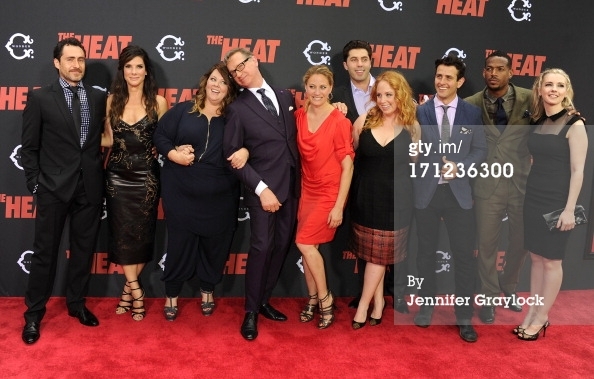 Joey, how did you come to be involved in "The Heat?" 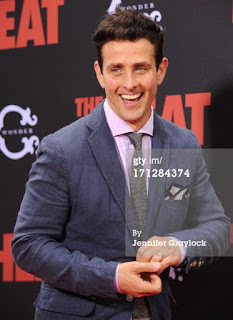 Joey McIntyre: I play one of the crazy, Mullins Family characters. We had done this spoof of "Mad Men" a while back, we called it "MA Men" (like Massachusetts Men). (Laughs) It's sort of a filthy parody, it was on "Funny or Die." You just never know in this business. You can do a bunch of guest spots on TV shows, letting people know you're into acting, and then just one little thing can come along that leads to something more. I got more heat - no pun intended - off of that than anything else. Two of the Bostonian actors from that are in "The Heat," and they probably put in a good word for me. Paul Feig: No, well, I can tell you. I saw that video and I was like, who? Is that Joey McIntyre? He's hilarious! Literally at that point it was done. It was a done deal. He was going in the movie. 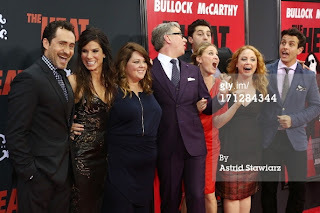 Joey McIntyre: When I read the script, it was just a blast to be involved. We just had so much fun. And being in my hometown (Boston), with all of these funny, funny people. It starts at the top. Paul is such a funny pro, such a nice guy. Then you add in Sandra and Melissa who are just like so cool and get along so well, it just sets the tone every day. Joey, being a part of New Kids on the Block, you are a huge part of a lot of people's childhood nostalgia. My sisters I can remember, had all of the dolls and even had New Kids on the Block bedsheets in their room. What though, is nostalgia for you? The New Kids are on tour again right now, but what band from your childhood would you love to see reunite? Joey McIntyre: I just bought a coffee table book of The Clash and I was like, why don't they come back? Sometimes you don't want to come back and ruin what something was, but I'm kind of over it. But for me, I've seen the benefits of coming back. The good thing about being so young back in the day is that we are still relatively young today. You see bands doing it - The Rolling Stones and Aerosmith - but your fans are going to grow with you. But I would say The Clash, I would love to see The Clash get up there. They're older now, but that'd be pretty cool. (Read the full interview with Joey and Paul Feig here). NKOTB will be on E! 's summer concert series on "E! News" this Friday at 7|6c and 11:30|10:30c. Here are a couple more video clips from the Mix 105.1 interview NKOTB did. Jordan talks about not being that excited to do the cruise when it was first suggested to them and Joey answers what guilty pleasure song he has on his iTunes. (L-R) Demian Bichir, Sandra Bullock, Melissa McCarthy, Paul Feig, Jamie Denbo, Adam Ray, Jessica Chaffin, and Joey McIntyre. Check out more photos from Getty Images here. The New Kids on the Block did a press conference at Mix 105.1 in Orlando on Friday. You can view some photos here, and here are some videos courtesy of Jennifer Bowman. Star 94 in Atlanta had a meet and greet with NKOTB, you can see the photos here. DJ Cindy Simmons had an opportunity to meet the guys and she talked about it on the morning show - you can listen to it here and read her blog about it here. Barclays Center posted some photos of the guys backstage. Check those out here. Danny was interviewed by The Miami New Times about getting back together with the New Kids on the Block, growing up the in the spotlight, the album "10", the tour and when asked about NKOTB's future plans, he said "We take a break. And hopefully, next year, we tour overseas maybe with both the same groups or a different package, maybe more European, but definitely take a break... We'll always be open minded. I don't know what it will be, but it's a process. It's all dictated by the fans." Read the complete article here. Boston TV Station WCVB Channel 5 will be airing the Boston Strong concert at 7 to 11 p.m. on June 29. Check out this story from the Boston Globe for more information. Joey and Jonathan were interviewed by Tony Stark on Virgin 96 in Montreal. They talk about Instagram, being in a group versus being a solo act, where do the like to go on vacation, being an original "boy band", Boston Strong, tips on writing a love song and more. The New Kids on the Block will be featured on E! 's Inside Track Summer Concert Series and will feature footage from their Detroit concert. According to the Hollywood Reporter, "each segment will showcase an exclusive interview, behind-the-scenes access to the prep work that goes into the tour, tour bus access, meet and greets with fans and concert footage." No word yet for the exact air date. Some celebrities have attended some of the recent shows and after parties including, Joey Fatone, Amy Carlson and K7 TKA. It looks like there will an after party at PURE Nightclub inside Caesars Palace after their show in Las Vegas on July 6. Click here for more info. The guys visited Seacrest Studios at The Children's Hospital of Philadelphia on Saturday. Check out a photo here. Some fans are putting together a special surprise for Donnie's birthday. Check out @HappyBirthdayDW on Twitter for more info. BC TV interviewed fans at the show in Brooklyn. NKOTB now has a Tumblr page with lots of photos from The Package Tour. Blue Bloods season 3 DVD will be released on September 10 and is now available for pre-order on Amazon. Donnie did an interview with 13 News in Orlando. He talks about the Package Tour, Blue Bloods, Boston's Finest and more. ALLISON WALKER: We just met up with Jeff Timmons (98 Degrees) in Winter Park. He was yapping about you guys. Is it as kumbaya as he says it is? DONNIE WAHLBERG: It's probably more kumbaya than Jeff Timmons said it was [laughing]. In fact, in Orlando two years ago when NKOTB - my band - we were out with Backstreet Boys and we had been trying desperately to work with Boyz II Men. We were playing in Orlando and the guys from Boys II Men called and said, 'Hey, we can make it to your show tonight!' And we said, 'Well, you've gotta come out and sing a song.' When they came out, the building shook. I mean, Amway Center almost crumbled to the ground and, like, I knew right there that we're going on tour with Boyz II Men as soon as possible. It was an incredible night, an incredible experience. I still go on You Tube and look up that performance. AW: You guys sold out instantly. DW: I mean, every year we keep thinking, 'Well, you know, we're getting up in the 40s now. It's going to slow down.' But it doesn't slow down. We owe it all to our fans. They've been with us since they were little kids ... Instead of spending their parents' money to come and see us, they're spending their own hard-earned money. AW: You're also starring alongside Tom Selleck in "Blue Bloods." You said that Tom is a great guy until you do something - let's say - "special" on-set during the dinner scenes? DW: I eat constantly during the shooting of the dinner scenes. A lot of vegetables. The dinner scenes are over in 2 minutes, but they take 8 hours to shoot. After about 2 hours of the broccoli sitting in my stomach, it gets a little pungent on set. AW: You executive produce "Boston's Finest" on TNT. How is this unscripted series different from other "reality" shows? DW: Wed don't even like to call it a reality show because it's more of a docu-drama. We're so proud of this show. It goes inside the lives of the men and women of the Boston Police Department - both on the job and off the job. We found the most incredibly inspiring stories with these officers - some of the challenges they face in their personal lives and everyday they show up to work and put their lives on the line to protect the very streets they grew up on. It's been an eye-opening show for me. I had high hopes for the show and believed that me and my partners could produce a great show. I'm just so inspired by it. I've been, like, moved to tears more than once watching this show. These officers are nothing short of amazing. NKOTB Q&A - Donnie Wahlberg Has Nice Things To Say About Pittsburgh. During our Q&A Donnie was asked about his acting. He stars opposite Tom Selleck in the CBS series Blue Bloods, as if you didn't already know. A few years ago, he filmed the Spike TV mini-series The Kill Point in Pittsburgh and had a lot of nice things to say about our city. NKOTB Q&A - Which Fans Were Wilder...Teens Or Adults? During our Q&A session with New Kids On The Block in the Baierl Acura Theater, the guys were asked which group of fans was wilder, teenagers or the adults they had become. NKOTB Q&A - Joey Talks Boston Marathon. Before performing at the Consol Energy Center, NKOTB sat down with Melanie Taylor and Star Listeners for a Q&A session in the Baierl Acura Theater. Joey McIntyre talked about his experience running this year's tragic Boston Marathon. Prior to their show at Consol Energy Center, The New Kids On The Block stopped by 100.7 Star for a Q&A session with fans in the Baierl Acura Theater. They talk about hockey and then Kate Crawford, a listener who is battling cancer, asked the guys what is on their bucket list as she crossed off an item on hers, hangin' tough with NKOTB! The New Kids on the Block were on ETalk. In this interview which was recorded in their dressing room at the Air Canada Centre, they talk about performing in Toronto, The Boston Strong concert, and more! Danny was interviewed on 104.5 CHUM FM on Friday morning. He talked about the US/Canada border issue that caused them to postpone the Ottawa show, performing at the Boston Strong concert and more! 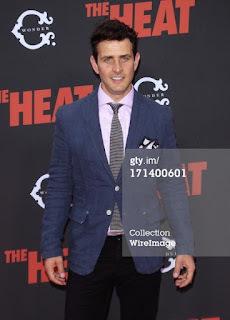 It's tough being a teen heartthrob and no one knows that more than New Kids on the Block’s Joey McIntyre. Access' Michelle Beadle sat down with Joey and got his take on the Bieber backlash. Plus, what was the wildest fan encounter Joey ever had? Ottawa concert has been postponed until tomorrow night. Over 30 days without a day off could not stop us. No voice couldn't stop us. Immigration, on the other hand, has forced us into a day off! Tonight’s New Kids on the Block concert has been postponed one day. 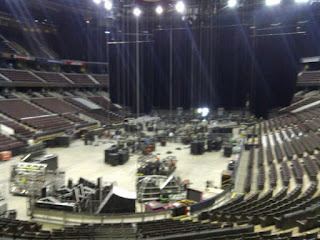 The band, along with Boys 2 Men and 98 Degrees will be at Scotiabank Wednesday night at 7:30 p.m. More to come. Jordan: "At the Mix Block party in Medford!" 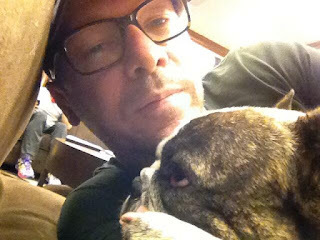 Donnie shared this photo of him and his dog Lumpy snuggling before the show. Danny was interviewed by Cleveland.com where he talks about how being in the group effects their solo endeavors, NKOTB-paraphernalia, being a "former child star", his favorite tracks on the new album, pitch correction in recording and more. Boy bands have been around since the first issue of Sabertooth Tiger Beat profiled Nate & the Neanderthals, but nobody put it all together quite like the New Kids on the Block. Now, Danny Wood, Jordan Knight, Donnie Wahlberg, Joey McIntyre and Jonathan Knight are coming back to town, headlining "The Package Tour," which also features boy banders 98 Degrees and Boyz II Men. We got a quick email interview with Wood, talking a little about the "old days," and a little about today. PLAIN DEALER: Some of you have gone into producing, some into acting, some into other fields. Other than just the fame of being one of the kids in New Kids on the Block, how has membership in the group helped (or hurt) you in other endeavors? DANNY WOOD: I think none of us that will do anything that's bigger than the group itself. I mean, it was pretty big the first time around and now to be doing it again 15 years after we broke up and then to continue it for 5 more years, which is actually longer than the success that we had the first time around, I think none of us as individuals will do anything as big as the group. But, I think maybe with some of the guys with their acting it helps in some instances and hurts in some instances. It depends on maybe the casting director, or the producer, or whatever. We all just kind of roll with it and I think now we all view it as completely positive and if someone has a negative opinion and it hurts you in some other endeavor that you want to do, that's their problem. PD: The initial group of fans are now in their 30s. Are those the fans who are coming back to you, or are you picking up new ones – maybe their daughters? DW: Definitely picking up new fans, it's definitely gone to that next generation. The first time around fans have grown up, and have their own kids, and now some of their kids are now fans. Also doing the tour with the Backstreet Boys, we're noticing some younger girls in their 20s are coming to the show. I think now with the Internet and how you can get a lot of information on us and see what we have done in the past, I think that benefits us, and we definitely have some new fans, too. PD: What was the most bizarre NKOTB-paraphernalia (i.e. sleeping bags, dolls, etc.) that you can recall, and do any of you have any of it? DW: The stuffed animal dolls were the worst, most horrific things you could ever see. They look they would come to life and murder people. I do have one of myself that one of my daughters used to play with when she was little. PD: Paul Petersen, who starred in "The Donna Reed Show," has been a huge advocate of former child stars and fought their exploitation. Given what you've been through, was it worth it? DW: It was more than worth it. I am blessed and lucky to be doing what I love to do. We didn't fall into those traps that young stars fall into. I think a lot of that has to do with our upbringing in Boston and coming from big familiars, and kind of always having people around you that will be honest with you and give you their real opinion. I think that's how we avoided the pitfalls of fame when you're young. PD: This particular tour features some of the best in the boy band era. How did it come together? DW: How it came together is we're big Boyz II Men fans and we've been wanting to do something with them for the past two or three years. We've talked at different times about doing something, so after we finished with Backstreet Boys, we knew that was the next thing we wanted to do. At the same time, we heard 98 Degrees was getting back together and we're always trying to look to give the fans more for their money and we figured, "Let's add 98 Degrees on and see what the response is," and response has been amazing. PD: When you did a lot of these songs – and in particular, the dance steps – you were teenagers. You're, um, not anymore. What kind of steps, if you'll pardon the pun, did you have to take to get back into boy-bad dance shape? DW: I think that happened in the beginning when we first got back together. I think the guys needed to get in shape and adapt to dancing again. I definitely had to adapt to learning choreography again after 15 years of not doing it. But now, five years later, there's not much of that. We all know when the tour's coming up. We kind of gear up and get into better shape than we're already in. We're a lucky group, all the guys are all in pretty good shape and now it doesn't take much. PD: The hiatus was a pretty lengthy one. What was the final piece that fell into place to get you back together? DW: There wasn't a final piece; it was the combination that Donnie found a great song for us to record, which was called "Click Click Click," that kind of started it off. Also, we have a great manager. our manager is Jared Paul, and he had a vision of what he wanted us to be doing. I think those two things were the final pieces to get us back together. PD: "10" is a lot more mature, for obvious reasons, than the earlier albums. But what lessons from then went into it? DW: I think we have a lot of experience, so I think the main lesson that we learned from back in the day to now is not to waste time. Especially when you're paying for it. You know, we put up our own money to make this album, so you kind of want to get in the studio, sing your parts and get out and make the most of it. We worked consistently, we worked hard, and we got it done really quick. I think the five of us together know how to go through that process and how to make the most of our time. PD: When you went into the studio for "10," did you have a particular plan or goal in mind? DW: The goal is always to just make a great record for the fans, and I think we accomplished that. We also want wanted to make a record that we would like and we would play. So along the way, by hearing the songs and saying we wanted to record them, we were accomplishing that because we knew we liked the songs then you gotta hope the fans like it and now we know they definitely dig it. PD: What are your favorite tracks on the new album, and why? DW: My favorite track is called "Wasted On You" and I think just because you get a nice flavor of Joe, Jordan and Donnie and for myself, I'm kinda fans of theirs. It's an emotional song and I love the lyrics, I love the production and if I had to pick one song, that would be it. PD: When you guys first started recording, it was the tail end of the tape period, before pitch correction, Pro Tools, etc. Do you think this technology would have changed the original NKOTB sound? DW: No, I don't think it would have changed the sound much. I mean, I think now it's more of a habit that people use the pitch correction and all that stuff, and the auto-tuning, but I think it's not right. It is a crutch for some people, you know, for the people that are maybe not so talented. But if you can sing, you can sing. PD: What's your favorite memory of those old days? DW: One of my favorite memories is us playing to over 100,000 people in Santiago, Chile, for an Amnesty International Concert. It was such a great cause the stadium we played is where people were killed and tortured and it was just an amazing and emotional time and especially for Amnesty International to bring awareness to such a great cause, was pretty awesome. Montreal, Toronto, and Auburn Hills after party tickets now on sale! Here is an interview Joey did with 95.5 WPLJ in early April. He talks about the new album, The Package Tour, stage fright, playing at the Apollo and more. Joey was interviewed by Gregg Daniels from Mix 104.1. You can see the video clip below. Also, check out this page for more details and photos from NKOTB's visit to a fan's home in Medford, MA. Jordan Knight of New Kids on the Block, Shawn Stockman from Boyz II Men and Drew Lachey of 98 Degrees tell TODAY why the mix of their 3 bands makes for the perfect concert "package" and reveal how they get along behind the scenes. Access Hollywood posted an interview they did with Joey. He talks about New Kids on the Block hitting the road with 98 Degrees and Boyz II Men for The Package Tour. What's it like being back on the road? How have things changed? Plus, what do his kids think about him touring? 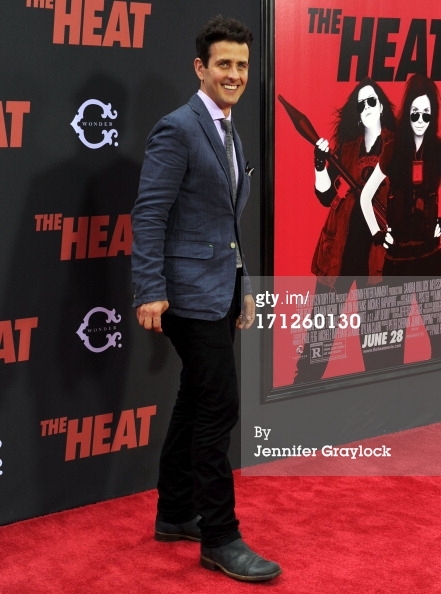 He also talks about the craziest fan encounter, Boston Strong, the movie "The Heat" and more.